Here's a new weight loss testimonial from my friend June. My husband and I are really proud of her results!!! She lost weight by taking Skinny Fiber and healthy eating; specifically fresh fruit, vegetables and chicken. Please make sure to give June your encouragement ... It's not easy to post pictures for the whole world to see. Plus, June wants to lose 10 more pounds and keep the weight off. 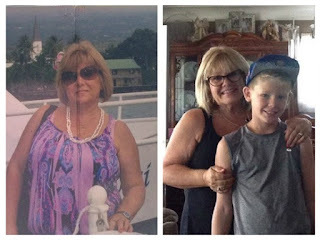 Over the past year, I've had a lot of online friends saying that weight loss over 50 years old is virtually impossible; June and many other people defy these odds. If this is how you feel, please let her before and after pictures, message and goals be inspiration because YOU CAN DO THIS, TOO!!! Commit to doing the 90 Day Weight Loss Challenge with us! Here's to your health and happiness in the 2016 year!